It's annoying to see your credit card rates jump up for no good reason. 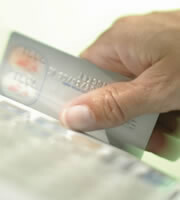 But many credit card companies have raised rates ahead of changes aimed at helping consumers. If you've received notice from any credit card companies that your rates are increasing, here are some things you can do to fight back. If your credit card company offers a temporary fix, such as six months at the old interest rate, decide whether it makes sense to accept those terms. This type of deal can be useful if you have the means to pay off the balance in full within the time frame. A large balance may be difficult to pay off over a few months, so it may be more advantageous to shop around for a new credit card. Search for a new credit card offering more favorable terms. Check out credit card rates, fees, and other features. Find out how finance charges are calculated and the length of the statement billing cycle. Zero interest balance transfer credit card promotions can offer a great interest rate for a period of time, but if you are unable to pay off the card during that time, you get stuck with higher rates later. You also are likely to be charged a balance transfer fee that could be 3% to 5% of the balance. Also, decide if you really need a rewards program tied to a credit card. Generally, credit card rates are higher for rewards cards. You also could end up charging more than you intend just to rack up points. Read through the credit card terms very carefully to make sure you understand exactly what's involved with opening a new credit line. 0 Responses to "Shop Around for Better Credit Card Rates"